You are at:Home»Business»How Can 80/20 Rule Boost Your Work-At-Home Productivity And Creativity? How Can 80/20 Rule Boost Your Work-At-Home Productivity And Creativity? 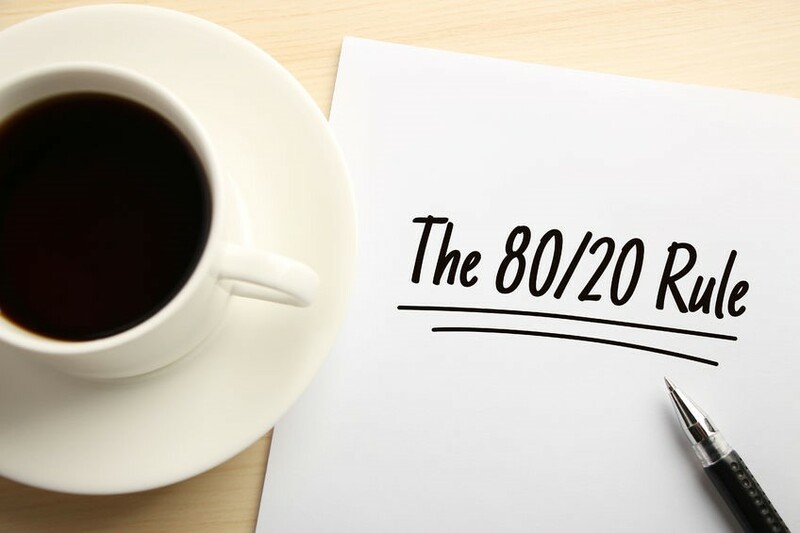 The 80/20 rule is also known as the Pareto principle. It has been used by various successful people to increase creativity, industriousness, and productivity. Most importantly, many people that work at home have stated that the Pareto principle (in combination with efficient time-management methods like apps) makes at-home work more efficient. But how valid is Pareto’s principle? Should you apply it in your life? And what are the benefits of implementing such a rule in your everyday existence? These are the questions we want to answer for you in this article. Interested? Let’s say that you have 100 minutes to complete a task. According to this rule, you will achieve 80% of your work in just 20 minutes, and 20% of the work in other 80 minutes. This sound bizarre, doesn’t it? Shouldn’t it be the other way around? Not according to Pareto. Pareto (who was an Italian btw) did an experiment in which he demonstrated that 20% of the Italian population owned 80% of the land. Bear in mind that Pareto was both an engineer and a sociologist (among other things), meaning that he knew how to observe society but also use numbers to constitute reality. The idea behind this is very simple; if you apply the Pareto principle, you will work less and achieve more. You can be more effective, more productive and more efficient, but still work fewer hours. How? Well, if you look at any creative project that you engage in, you will spend 20% of your time to create 80% of the results. Just take your average day as an example. Let’s say you work 8 hours a day, okay? So that’s 33% of your day. Then, you have to figure out how much of that 8 hour time is you actually working. What about breaks? What about cigarette breaks? Maybe you spent 20 minutes per day looking at your smartphone while you are at work. Perhaps you spend 10-15 minutes of your time talking to your colleagues. In the end, you’ll probably spend less than 20% of your time actually working. And during that time, you will make 80% of the results. Mind The Numbers If You Work At Home! The previous example is valid for your 24-hour cycle. But let’s now take a look at 8-hour period. Let’s again assume that you are working 8 hours a day at your home. Now, according to Paret’s principle, of those 480 minutes, only 96 minutes will be productive (let’s say 90 minutes). So, what you need to do is to identify those 90 minutes and monitor your behavior, patterns, tasks, and so forth. Bear in mind that this won’t be easy. Why? Well, it is because it is challenging for us to observe ourselves in an objective way. The idea behind this is not to find 20% and forget about 80% of your time. No, it only means that you should focus more your energy on 20% instead of 80%. You can use this principle in virtually all areas of your life, especially if you are a business person. Let’s say that I own a car shop. According to this principle, 20% of my cars will product 80% of my revenues, correct? Would it make sense to monitor your car shop and see which vehicles belong to that 20% list? It would. But why not take these things further? You can visit other car shops (competitors) and see which of their cars make the most money. Of course, this doesn’t mean that you should kick out 80% of your cars and keep only those that make you the most money. But, you can experiment with this. Try to increase the number of vehicles (that belong to 20%) by 5%, and see what happens. If this principle is correct, your revenues should increase. If this experiment proves to be successful, increase the number of valuable vehicles until you reach a critical point of the Pareto Principle. Furthermore, it is hard to find your 20% because you have no-one around you to monitor you. You don’t have co-workers that can observe you and point out something and say “There, this is when you did 80% of your work!” What I suggest is that you self-monitor and write down the results of your work. You need to create a system that will slowly but surely narrow your options. At first, you might figure out that you are more productive in the morning than you are in the afternoon. Okay, that’s great! So when in the afternoon? And what about the environment? Did you have breakfast or not? Did you talk to read the newspapers or not? In short, you have to take a vast amount of data and mini-methods to find that 20%. And when you do find it, you shouldn’t force it; focus, don’t force! The goal is to make 20% more efficient, not authoritarian. This will also allow you to relax more during the rest 80% of the time. Aforementioned can help you with stress, and it can help you focus on other things (not related to work), and so forth. Time management is vital for people that work at home. If you work at home, then you must know all the benefits of efficient time management. You can also implement 80/20 rule in your time management methods if you want to take these things to another level. Week Plan helped me plan my whole week, set goals and roles. Most importantly, I could prioritize my goals and directly apply Pareto rule on my life. On the other hand, Trello allowed me to control my projects, not my week. With Trello, I could see boards, graphs, and whatnot, and use them to develop my project but also monitor my growth. But other apps also allow time management and prioritization. An excellent example of a superb prioritization app is GQueues. With it, you can create a to-do list and put those projects that are in your 20% on the top of your list, ensuring that you follow the Pareto principle in your day to day basis. The easiest way to find your 20% is by being honest with yourself. If you ask yourself: “If I could do only one thing today (work-related), what would I do?” This method will not only help you find your 20% but will also help you set goals for your future. And once you find your goals, use apps to help you manage your time and prioritize your goals. I’ve noticed the significant impact of using time-management apps, but you must use them on a daily basis. The great thing about this principle (in combination with apps) is that you’ll notice results in very soon, which should motivate you to be even more productive and creative! This is K Kuchiya, a husband, father and founder of home cleaning and decoration blog CleanUpHome.com. I am very passionate for my work and of course I believe and follow of 80/20 rule. This is the only way to focus and increase productivity. With my blog I share my ideas for home cleaning and organization, to design and decoration, to detail product review. Very good advices on work! I work as a freelance writer at http://vip-writers.com, and when you work from home it’s hard to self-discipline yourself. If anyone is interested in career of a writer, i invite you to our team! It’s a great way of additional earning, if you are a pregnant mom like me!